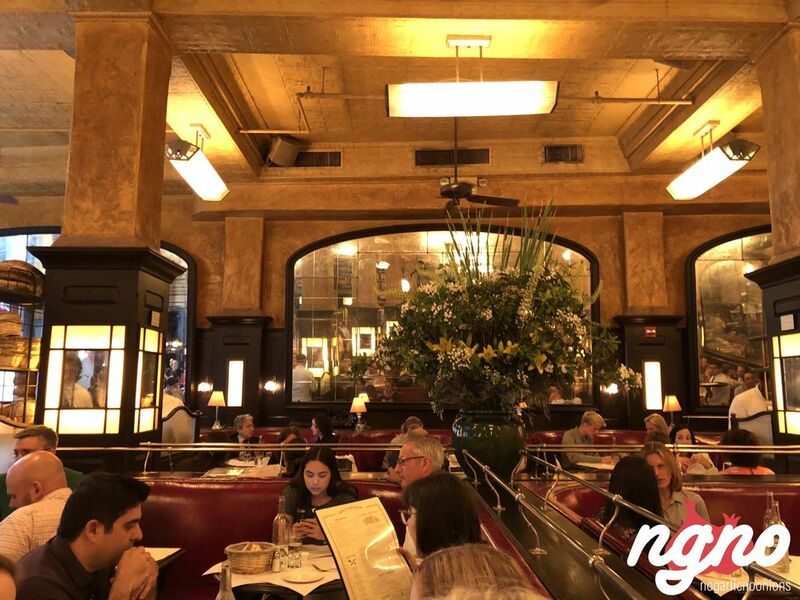 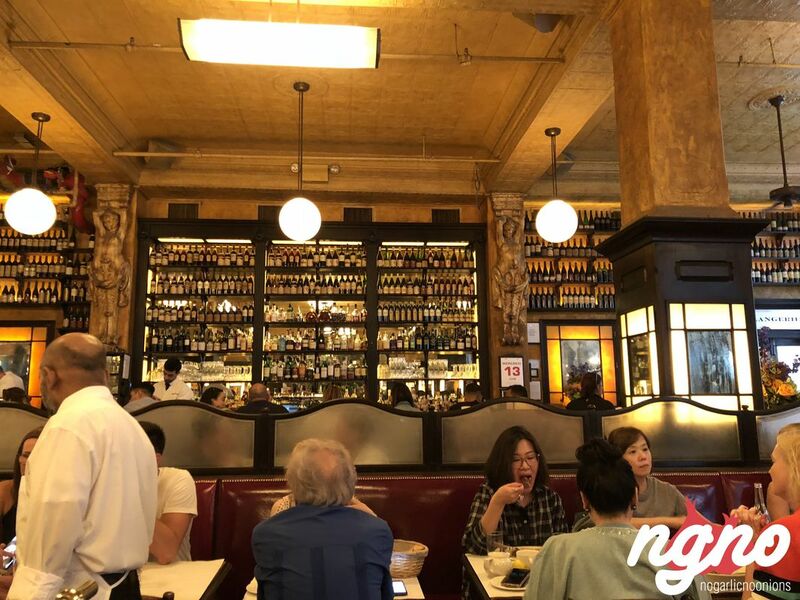 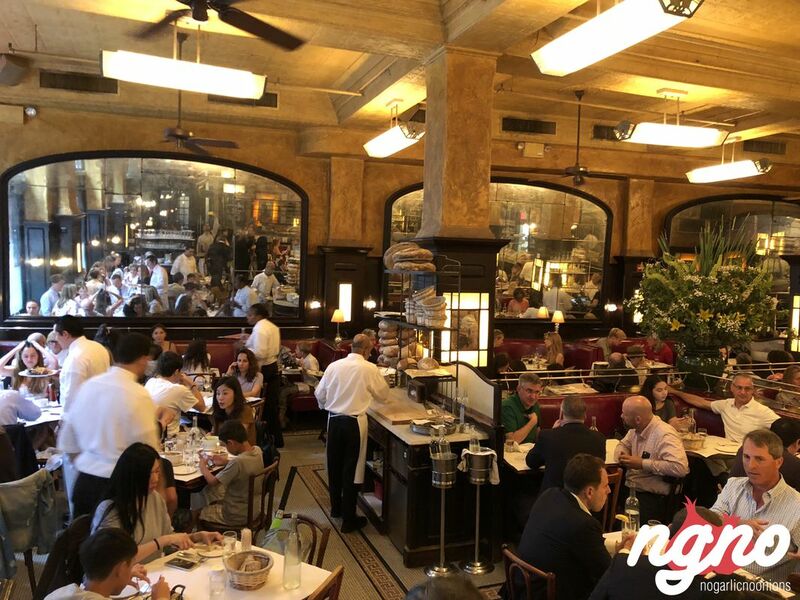 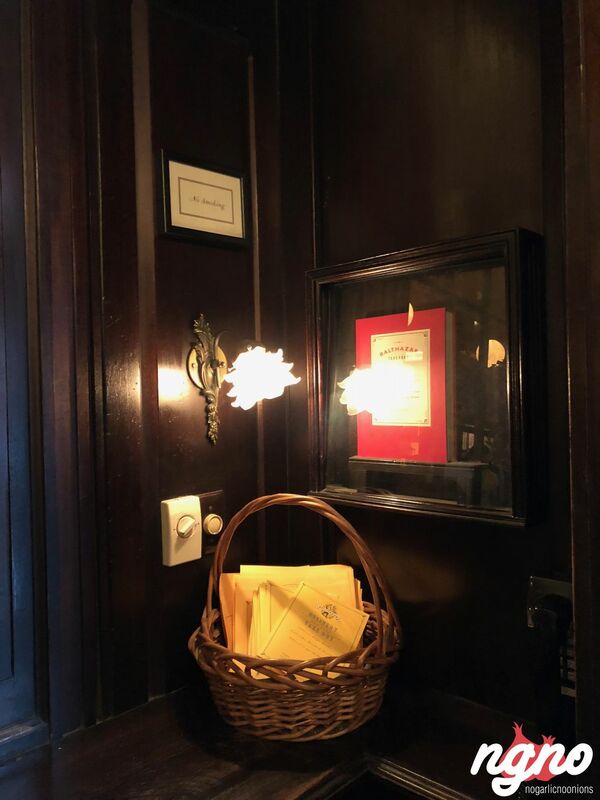 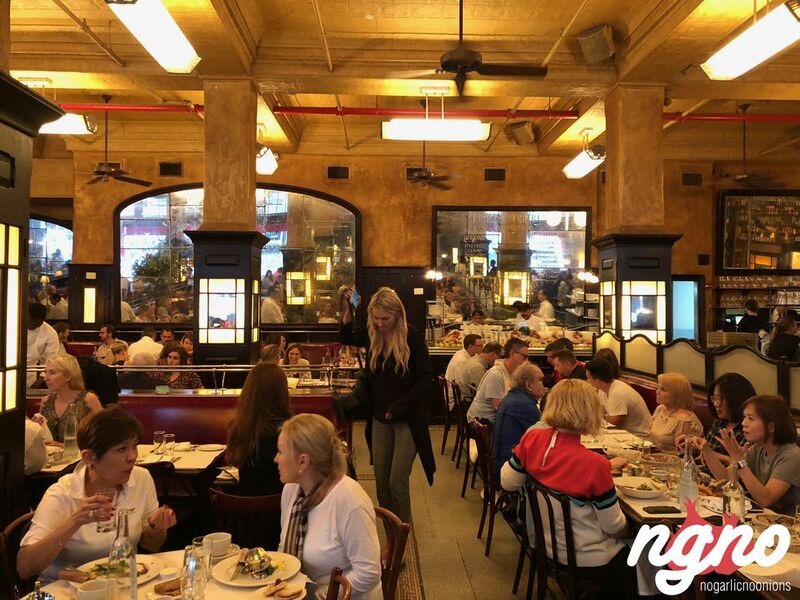 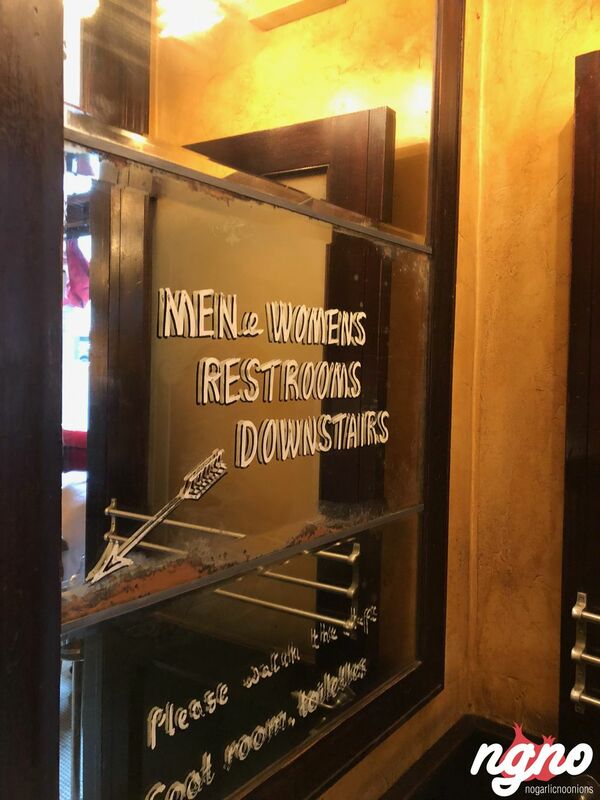 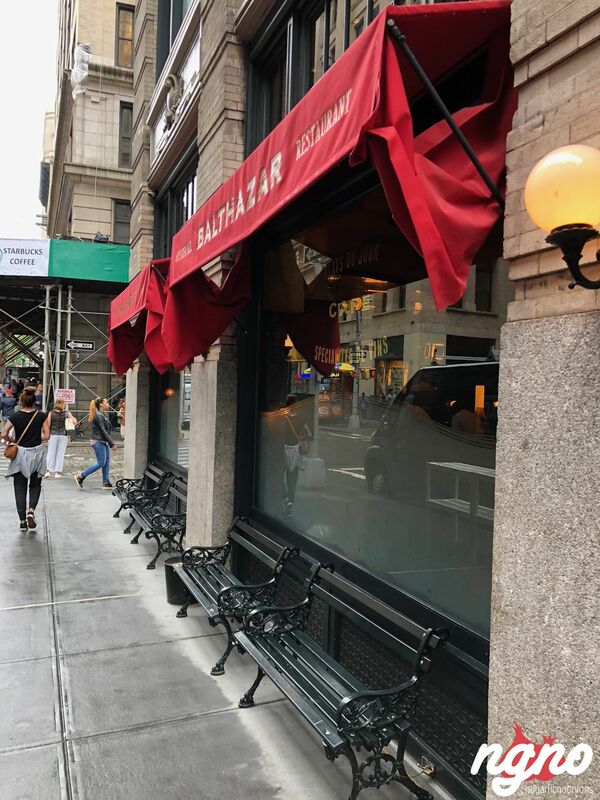 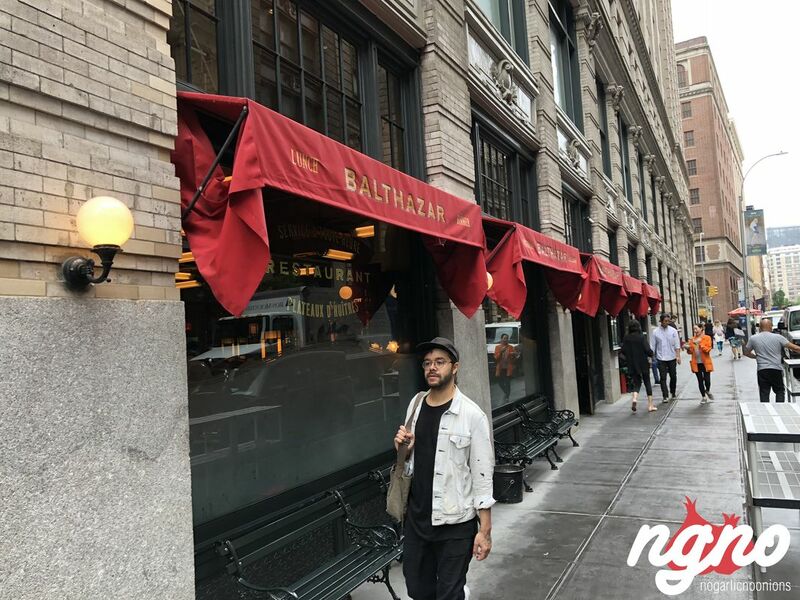 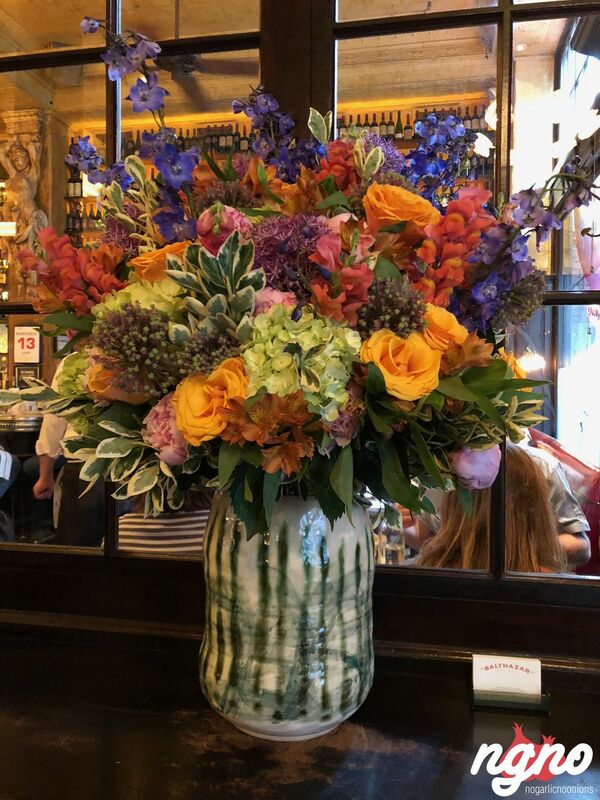 Balthazar is New York’s most famous French brasserie open for breakfast, lunch, and dinner, serving a traditional French cuisine with a touch of class and refinement. 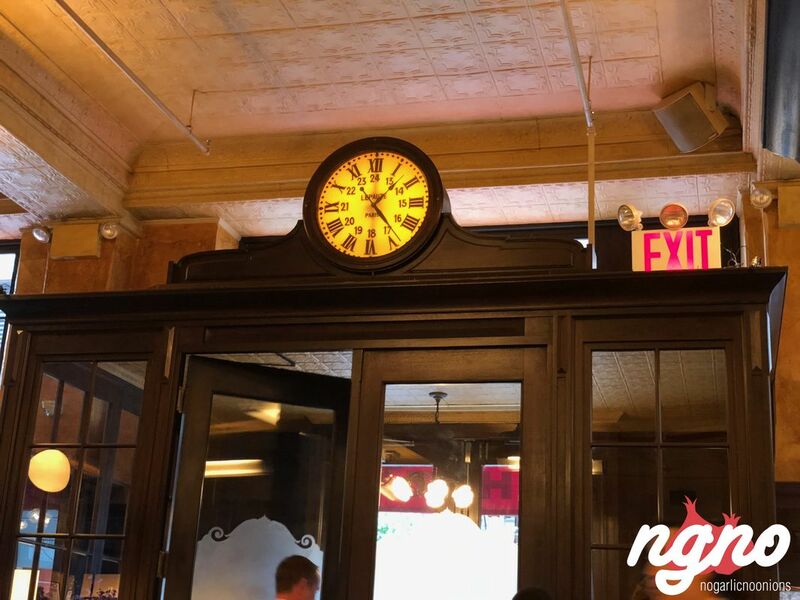 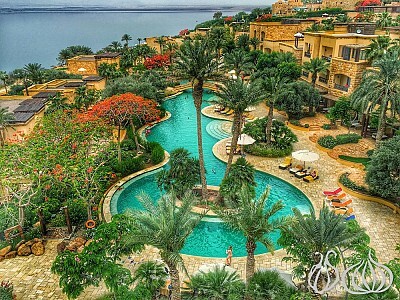 Arriving at 1 pm on a Wednesday, the place was extremely loaded with guests waiting in line to be seated. 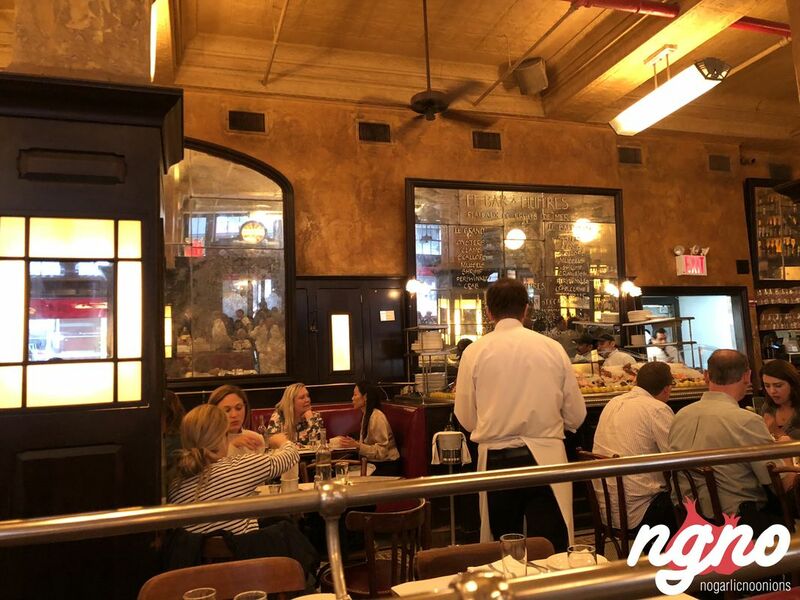 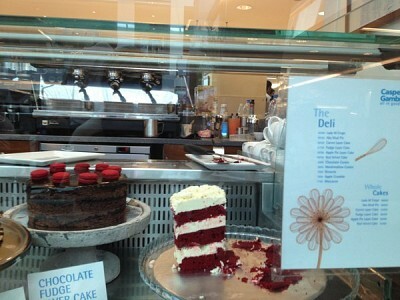 After enjoying the experiences in London and breakfast in New York, I was back for lunch. 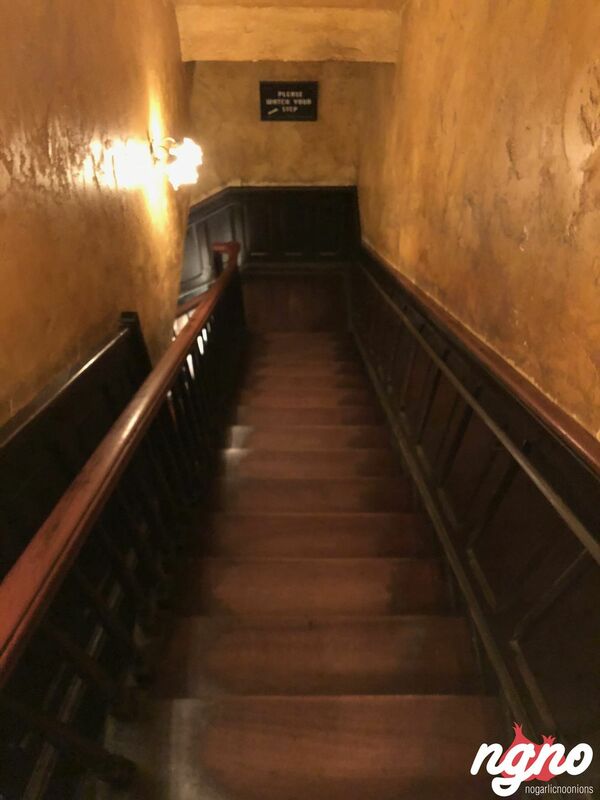 For info, a photo I took here last year has already been viewed by seven million persons on google maps; I was ready to post more photos. 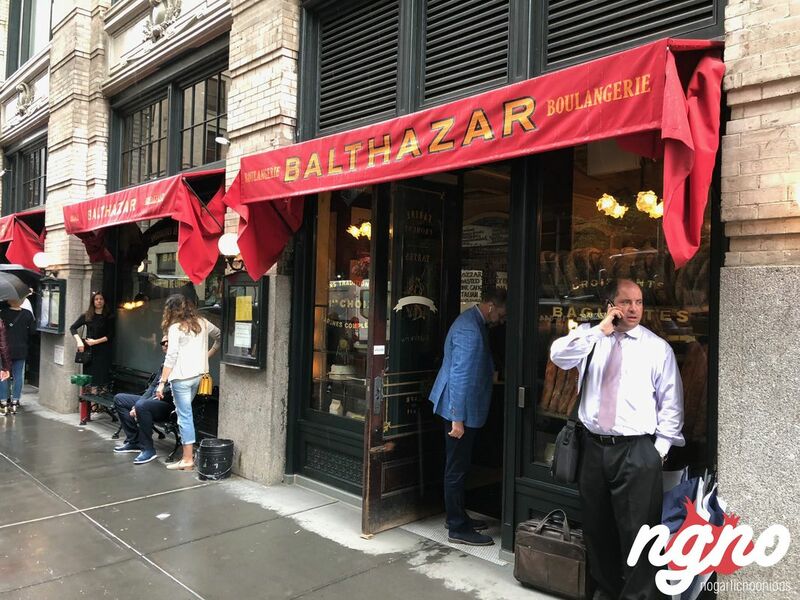 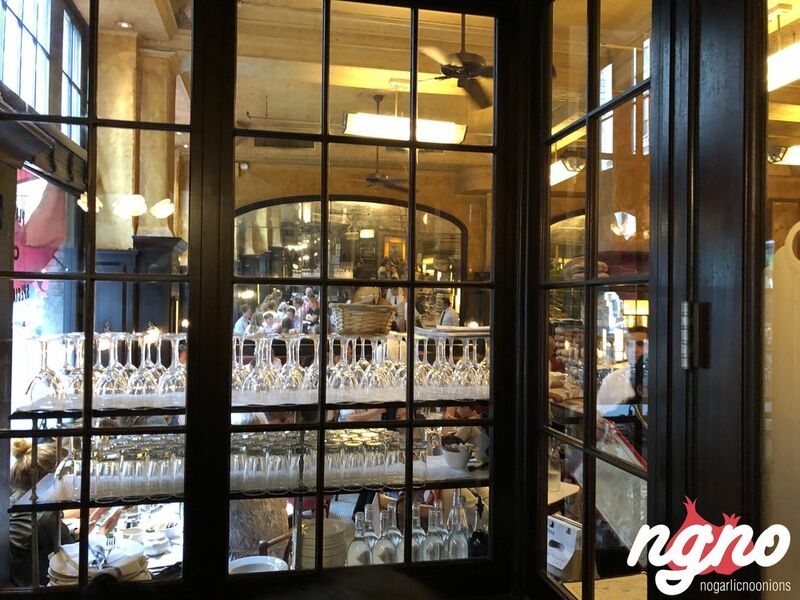 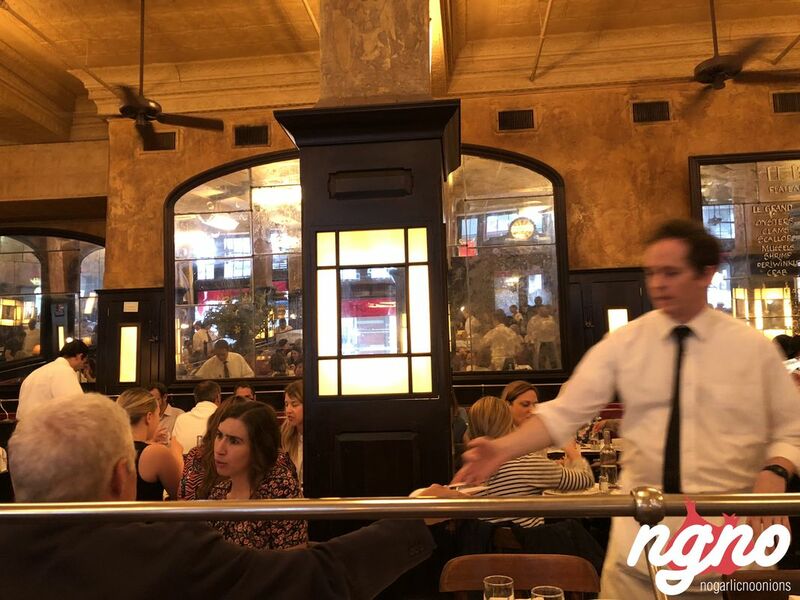 Balthazar is typically French: tiny tables seat hundreds of guests every hour surrounded by mirrors and a display of bottles. 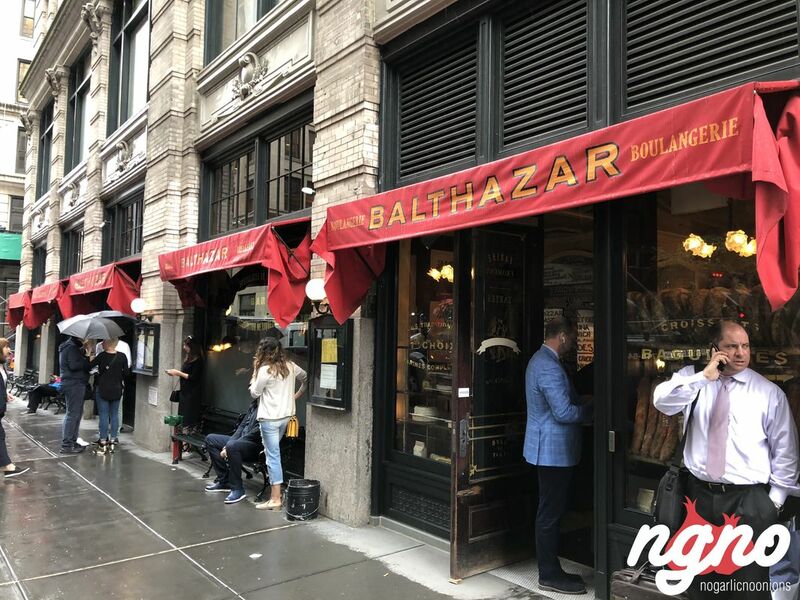 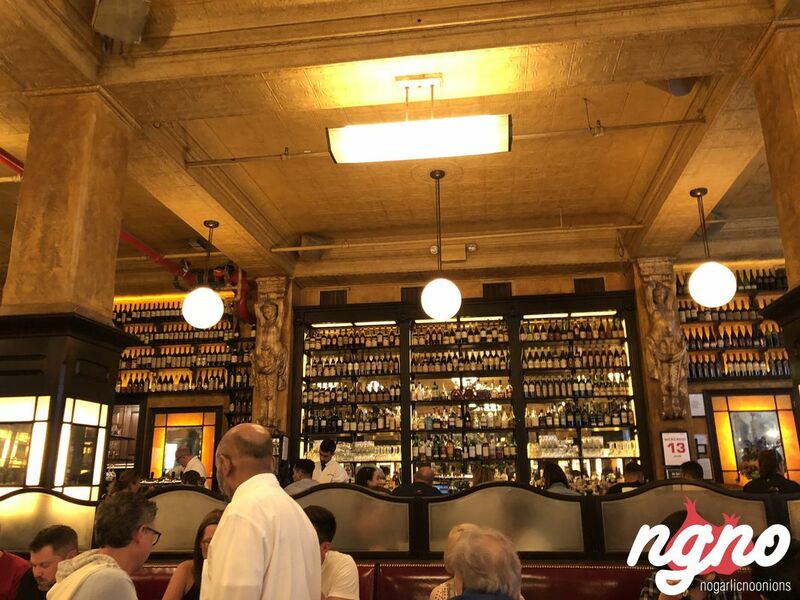 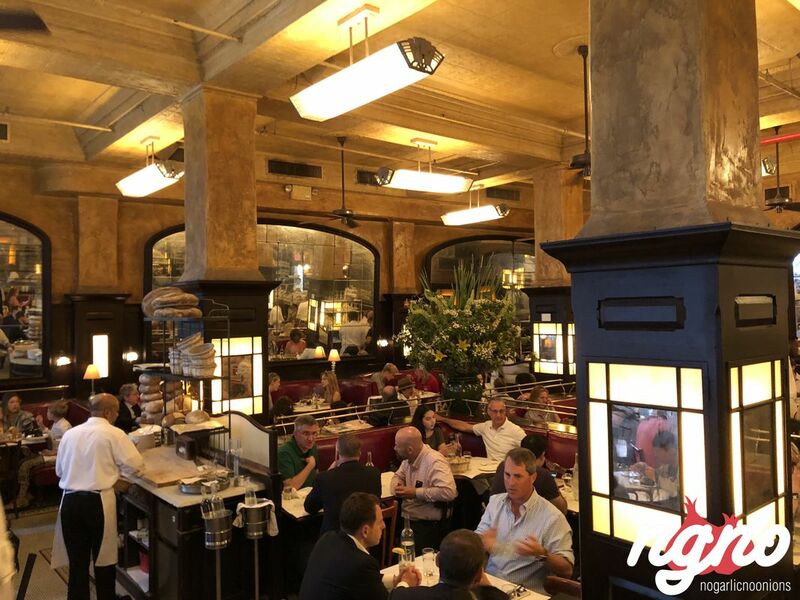 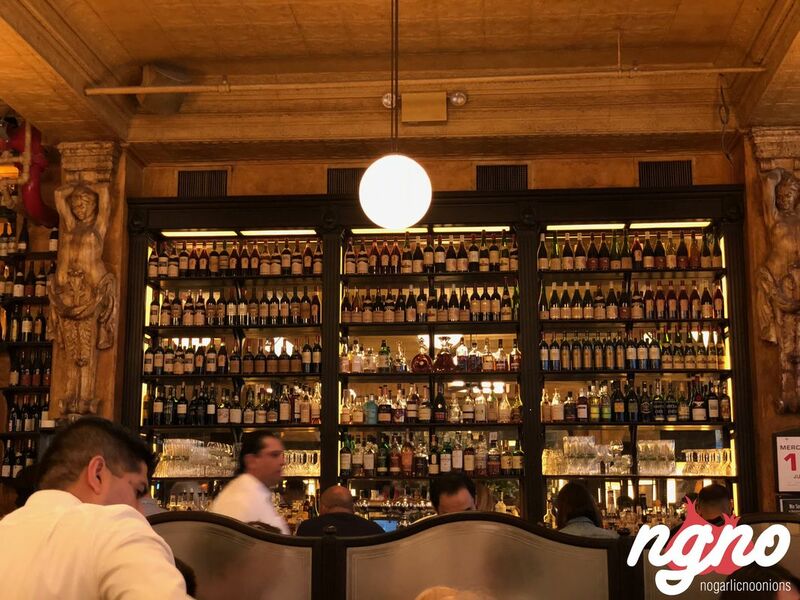 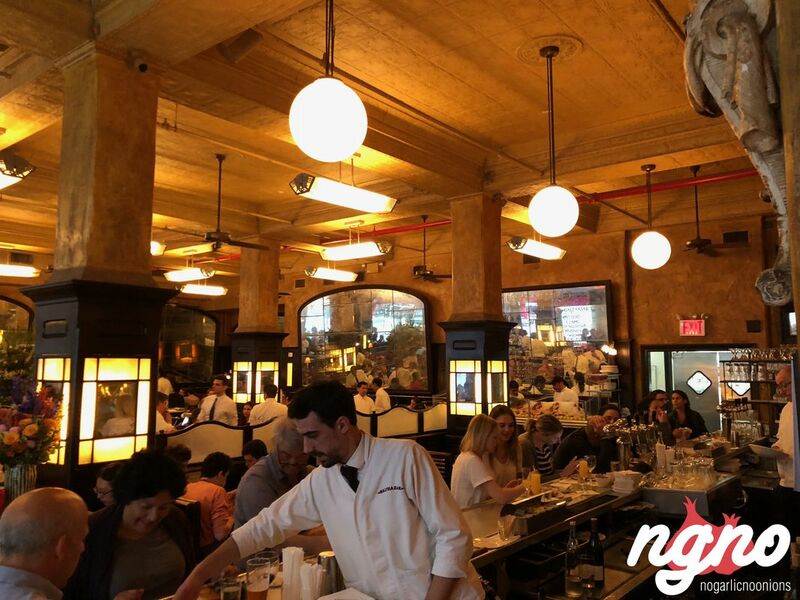 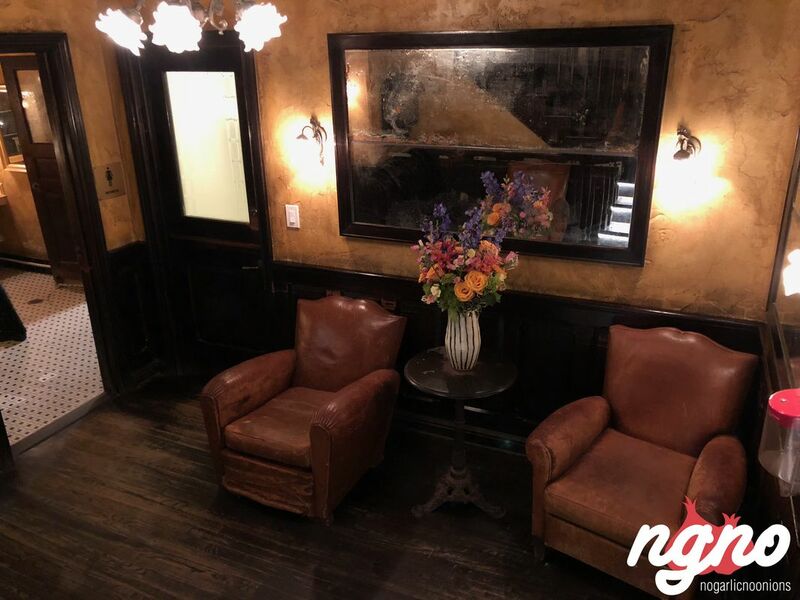 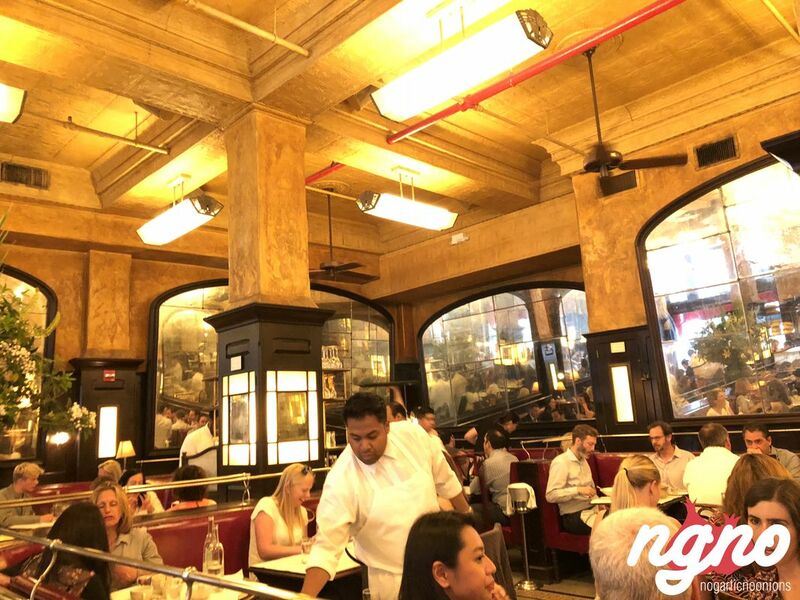 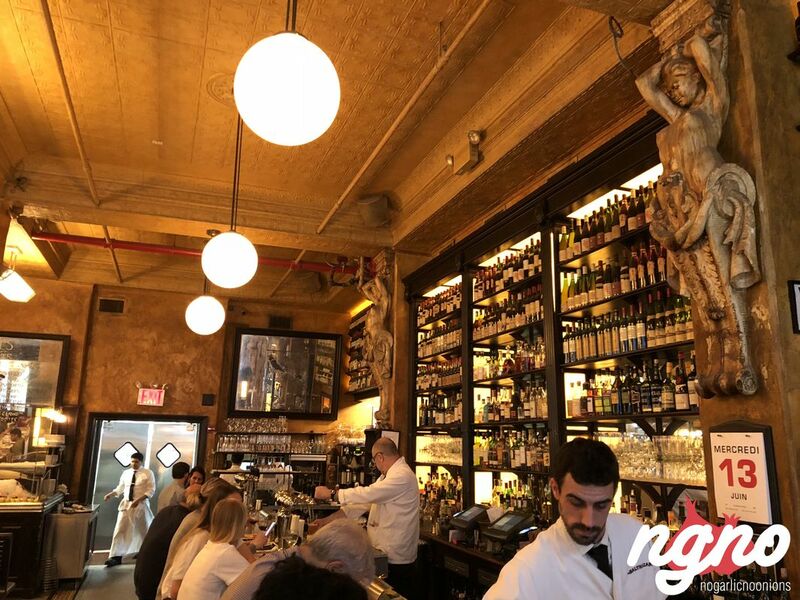 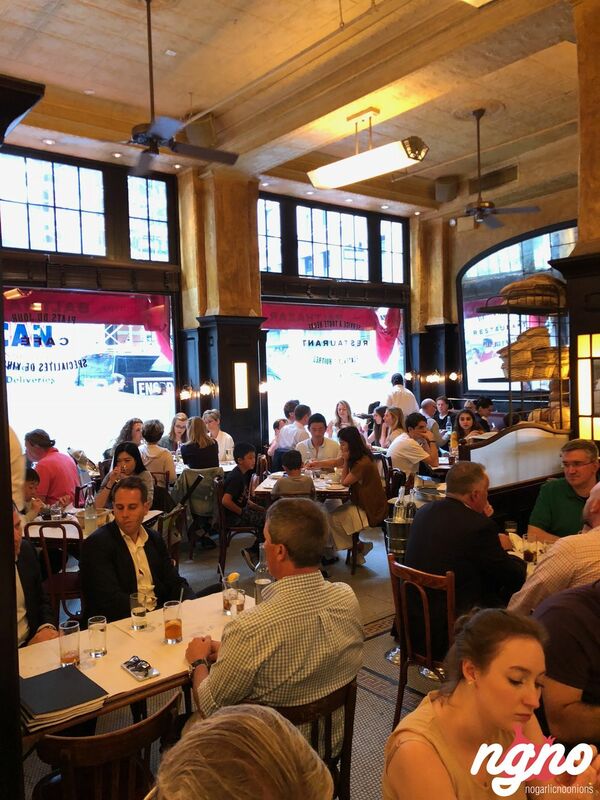 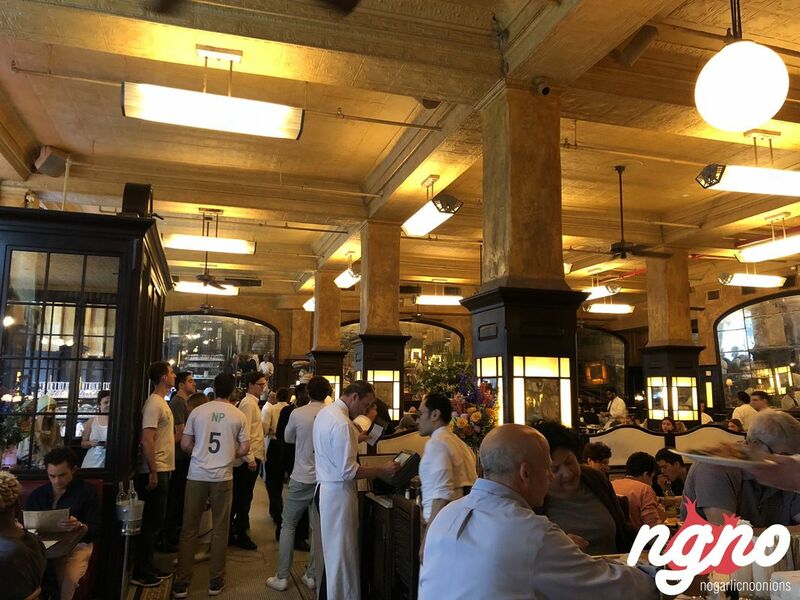 A bar on one side, a seafood display and several leather benches, the vibes at Balthazar are unique. 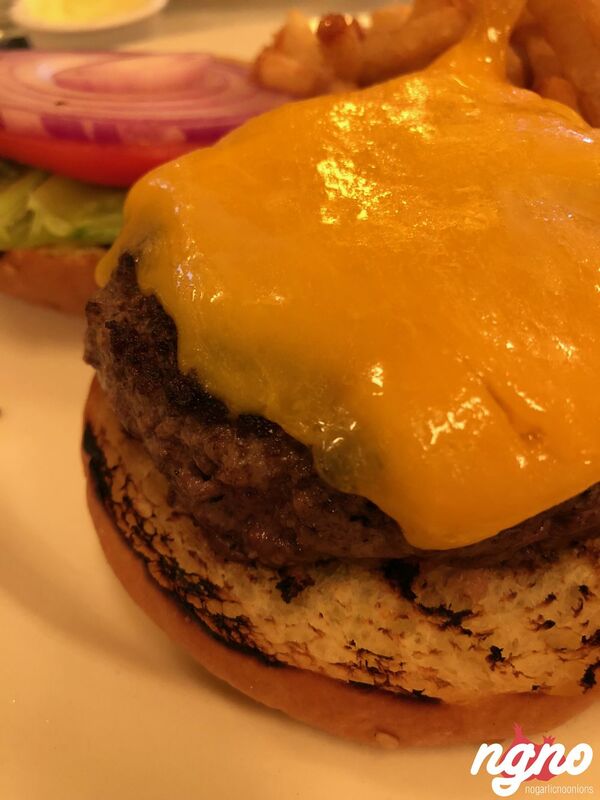 Yellow is the color to which your eyes will accommodate after few minutes. 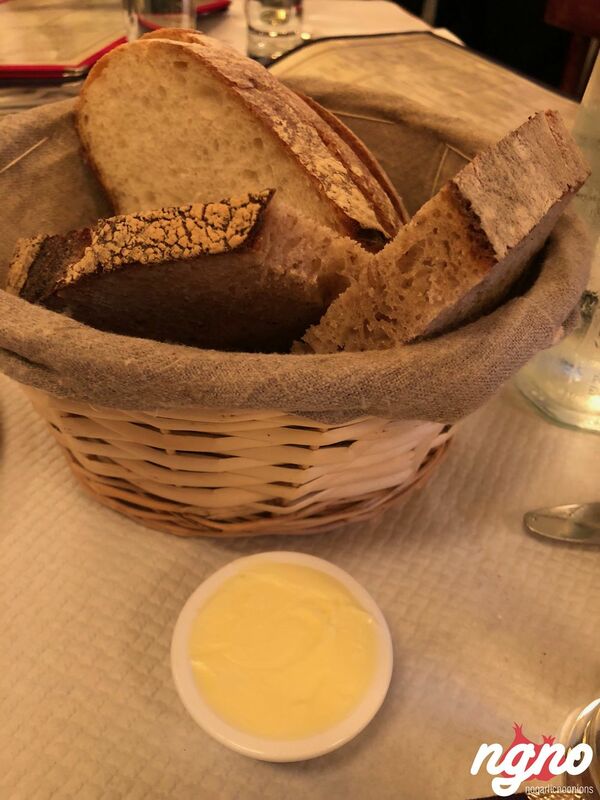 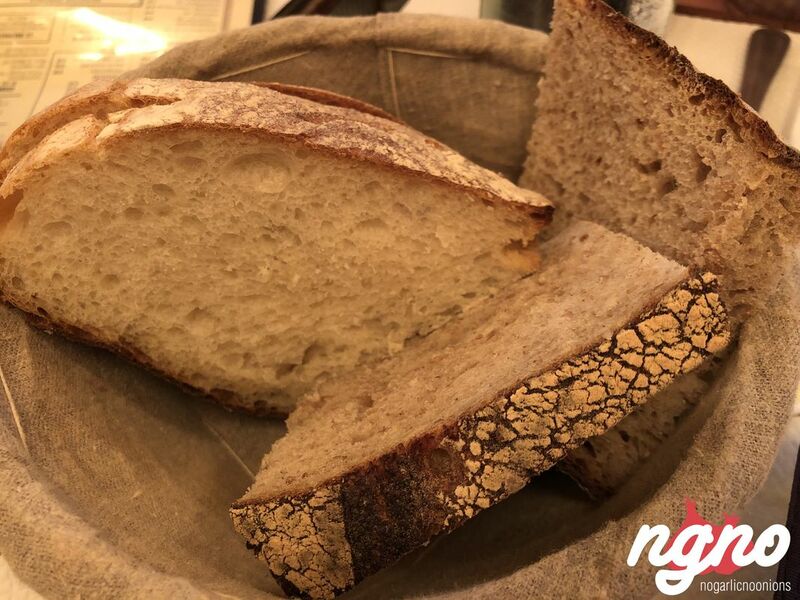 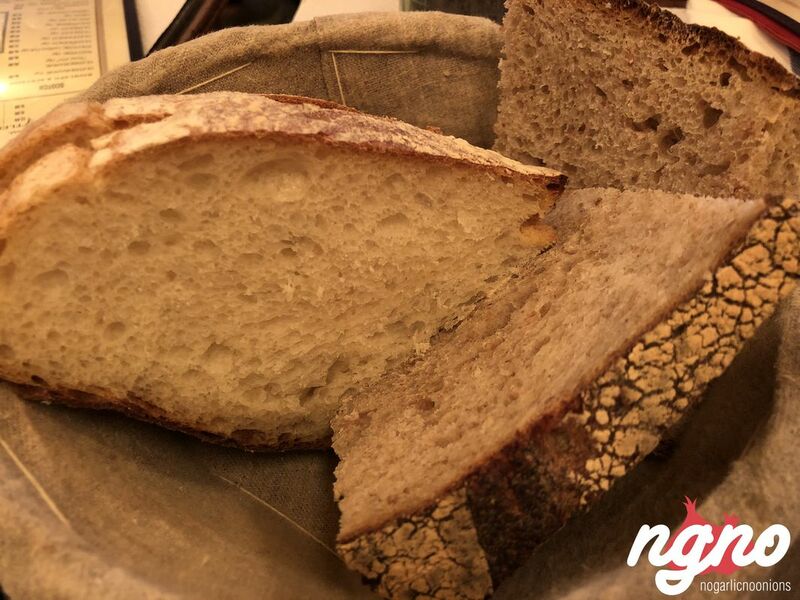 Start lunch with a basket of bread and butter; creamy butter left out of the fridge with a basket of French sourdough bread feeling moist and cold. 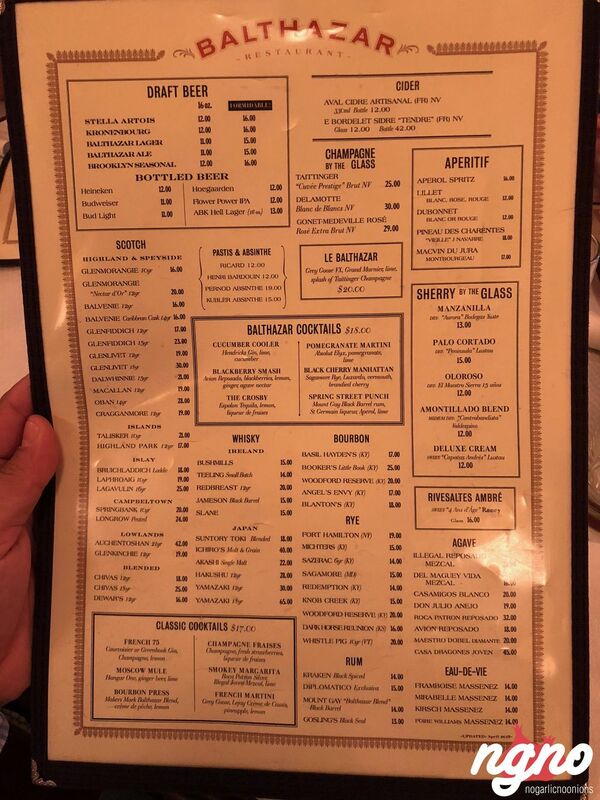 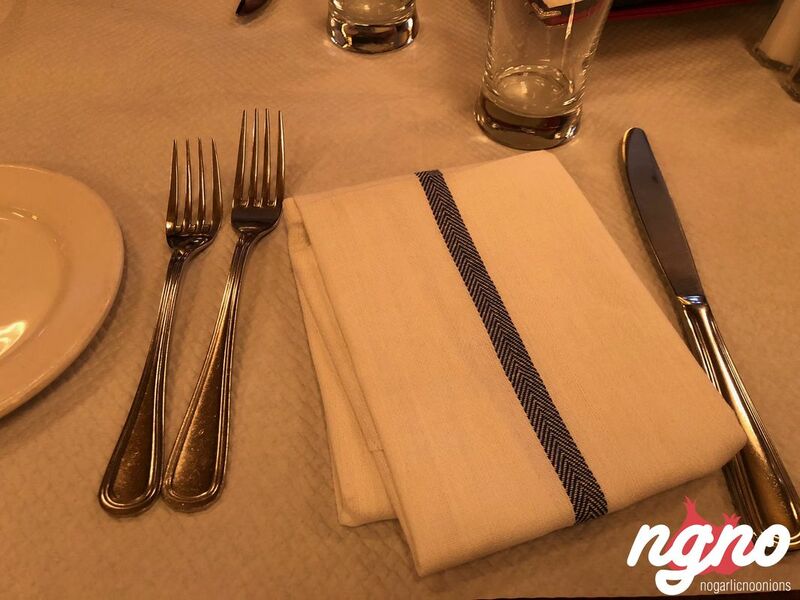 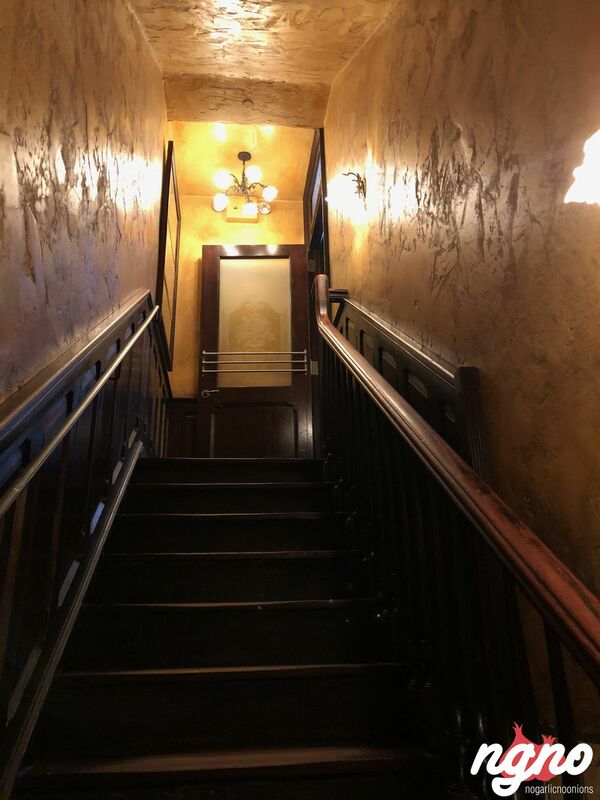 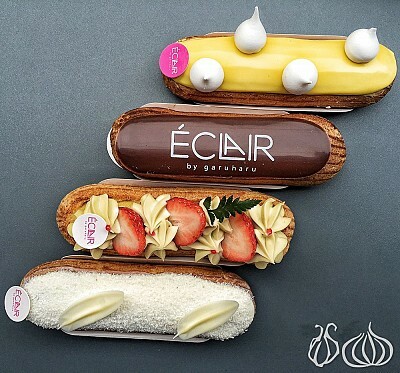 On the menu: hors d’œuvres, starters, salads, sandwiches, oysters, plat du jour and the famous meats. 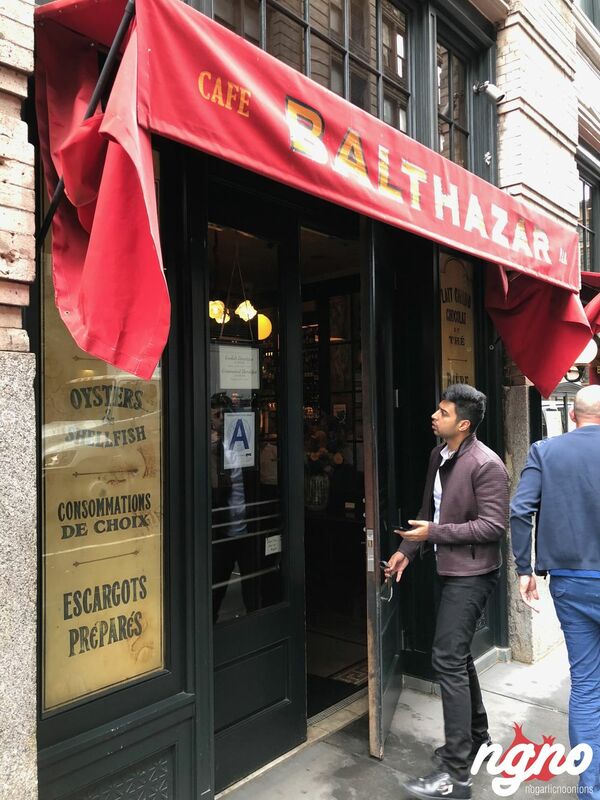 They say that Balthazar has a unique steak frites and a tasty burger. 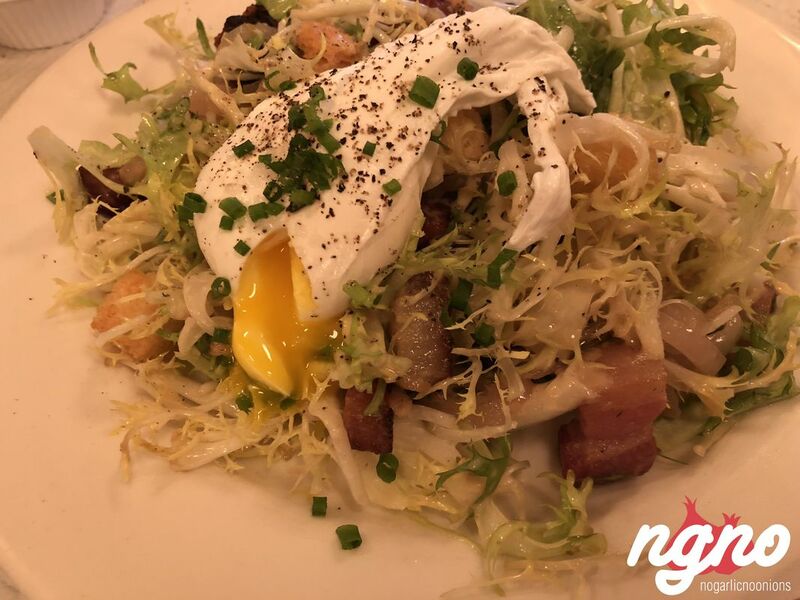 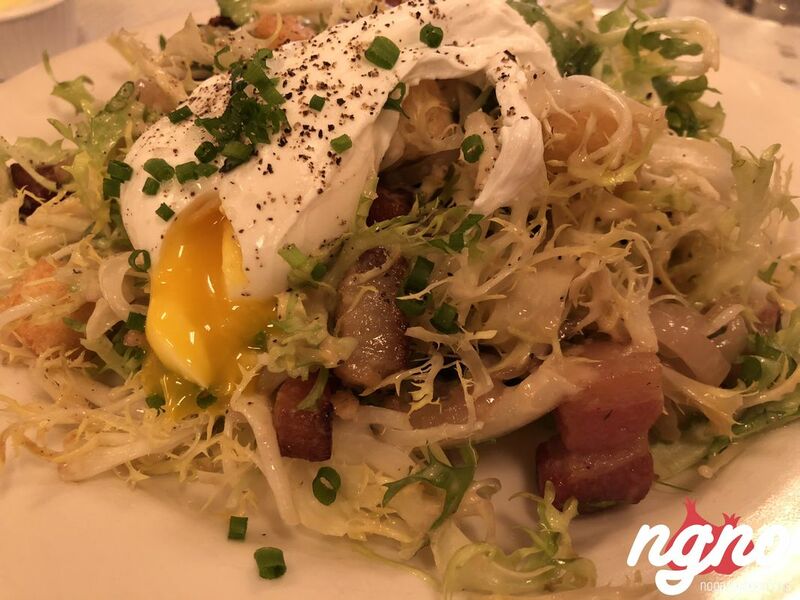 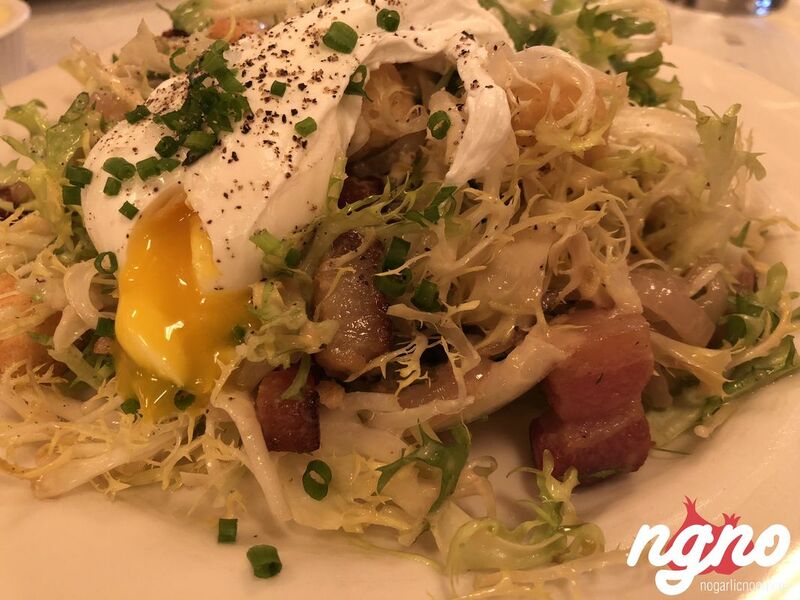 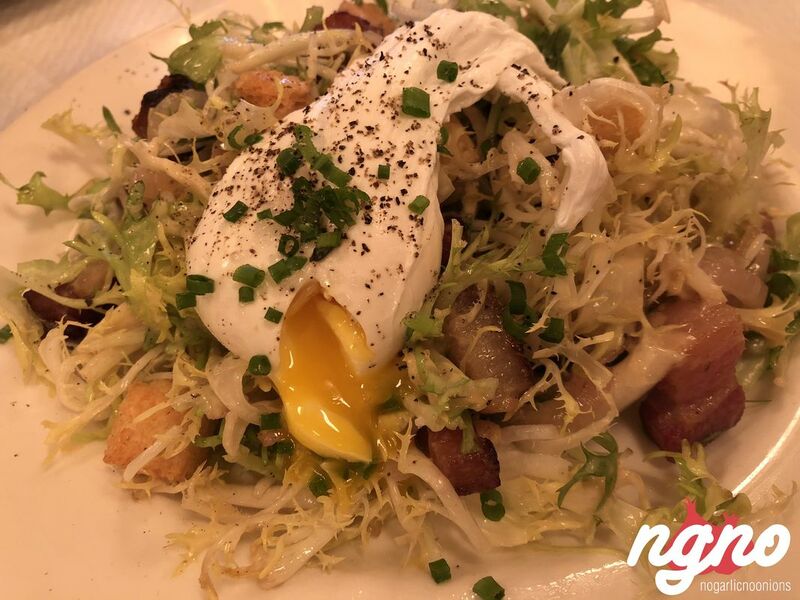 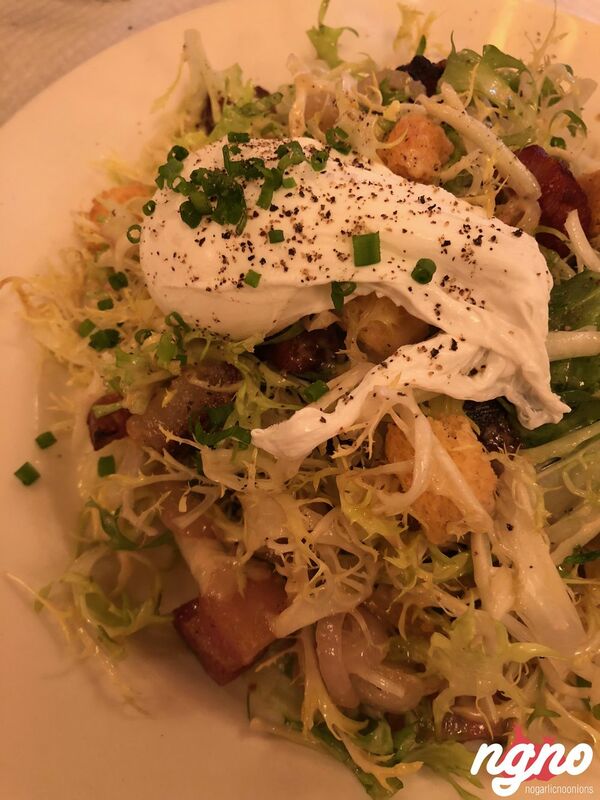 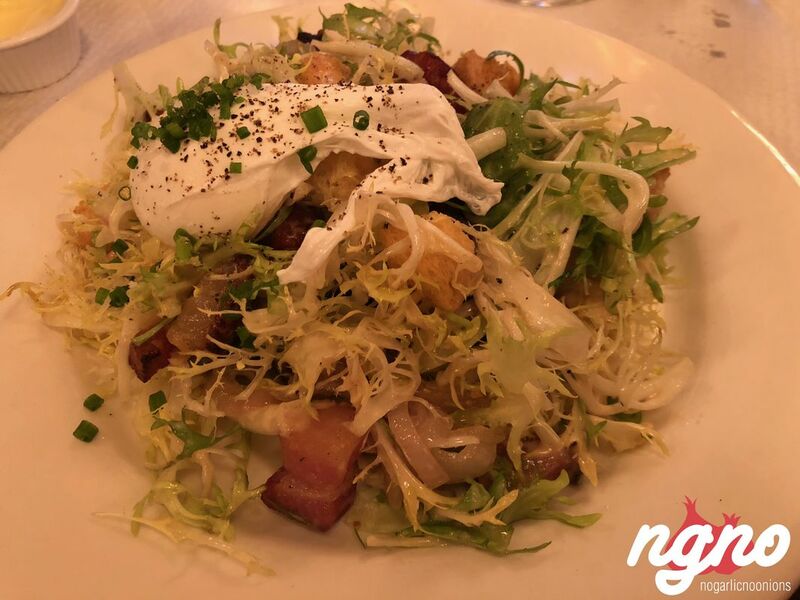 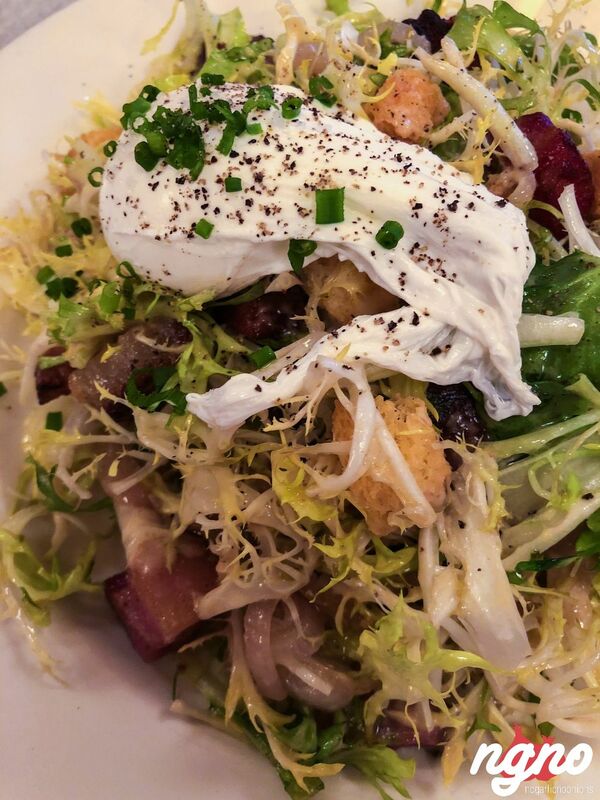 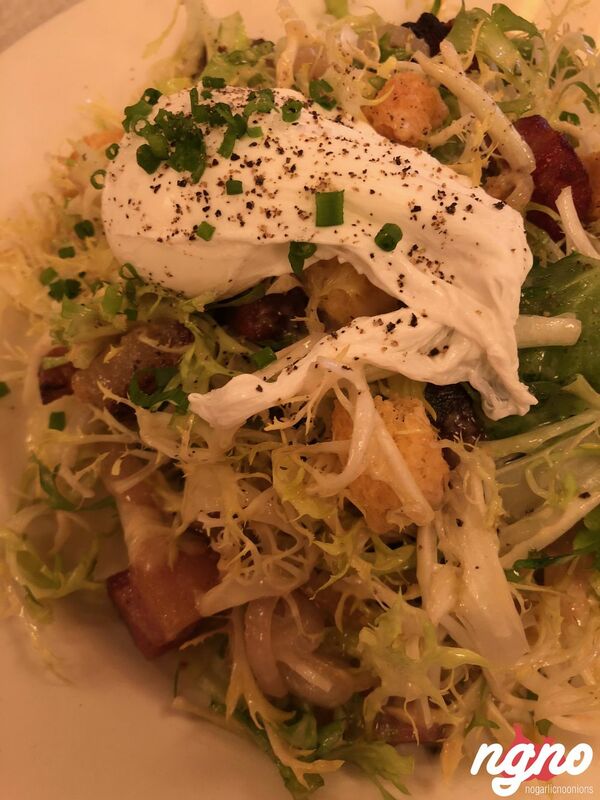 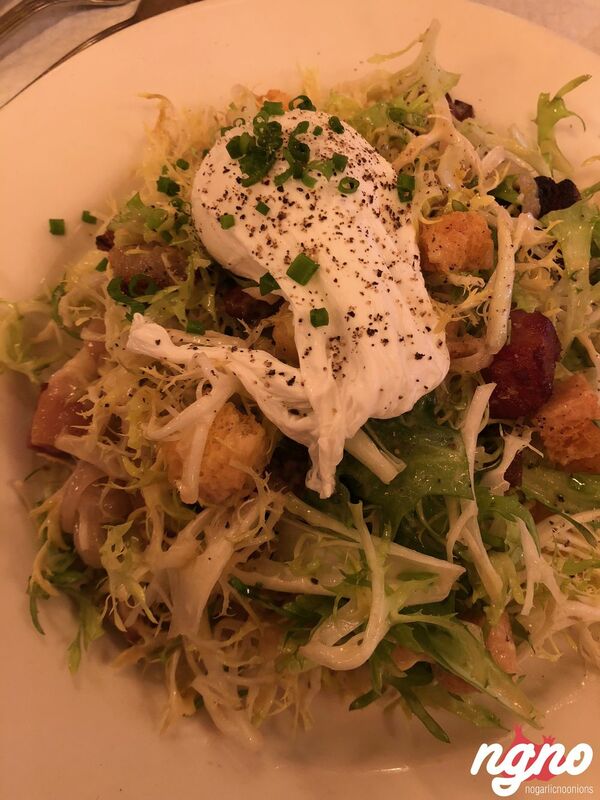 Bacon frisée lettuce salad with a poached egg. 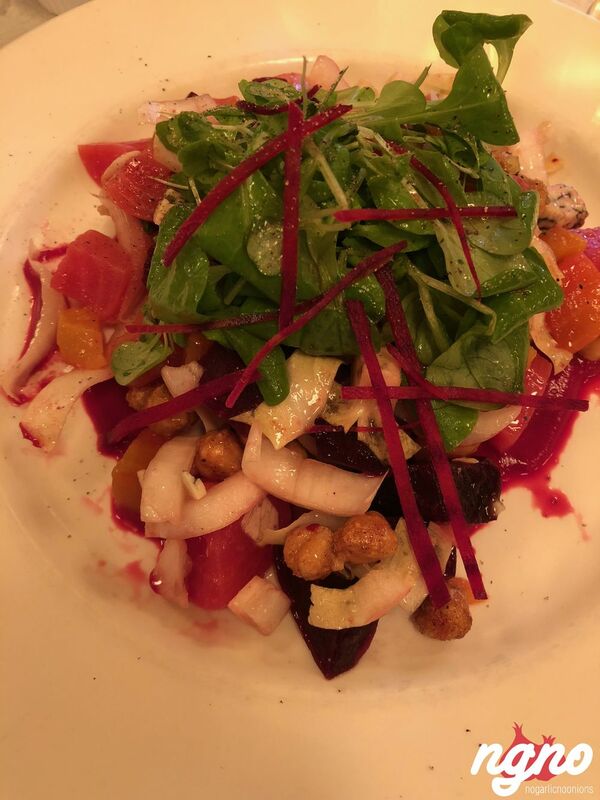 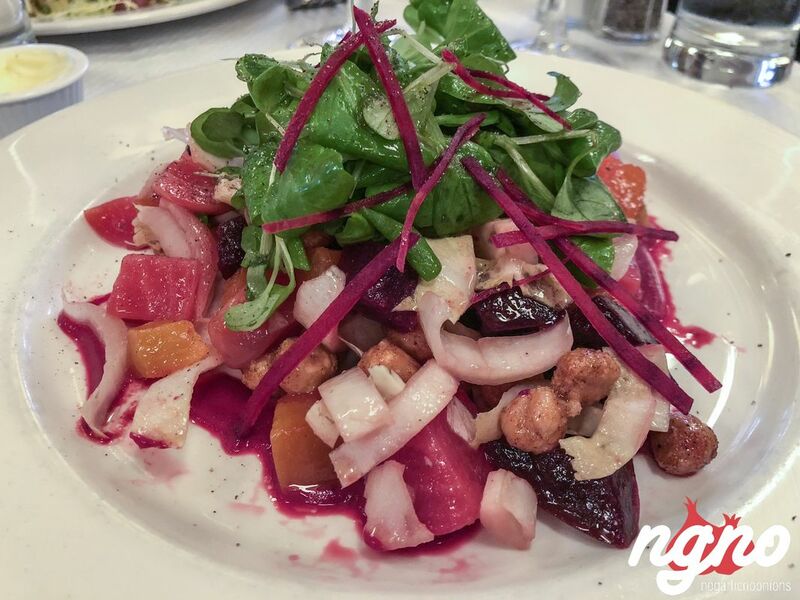 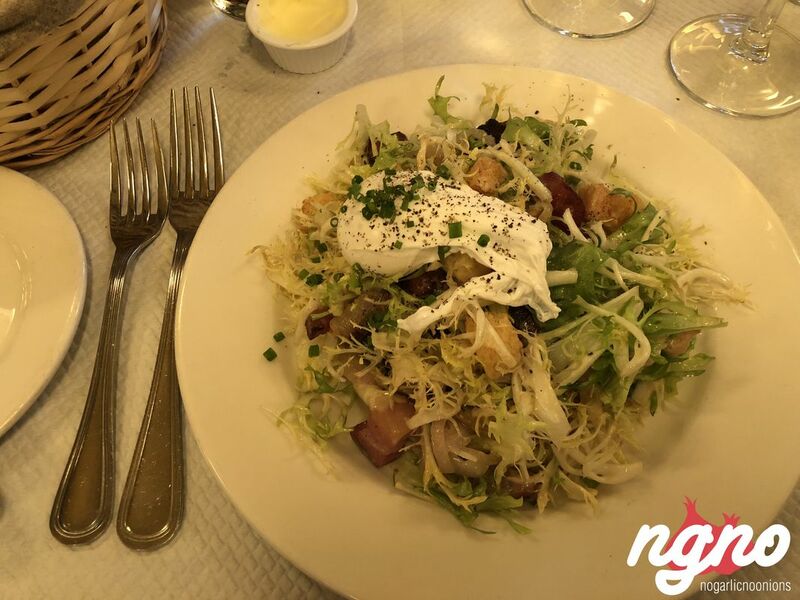 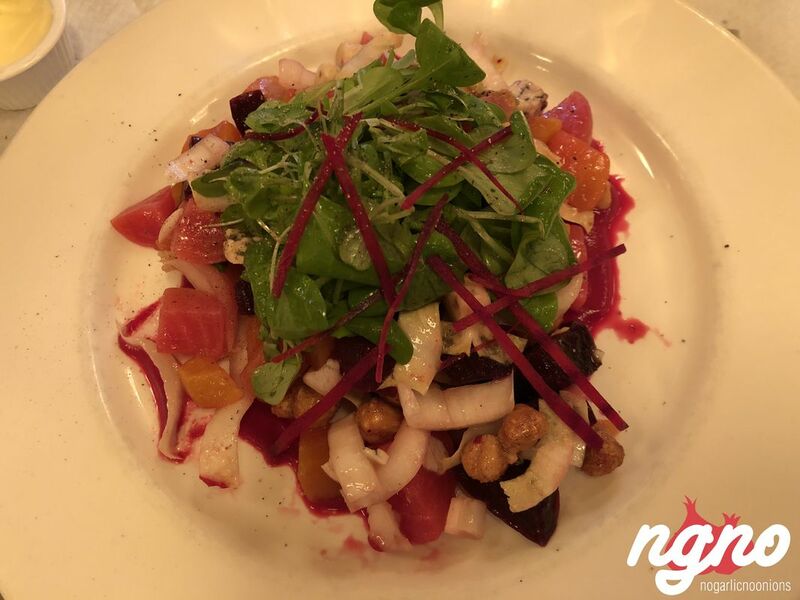 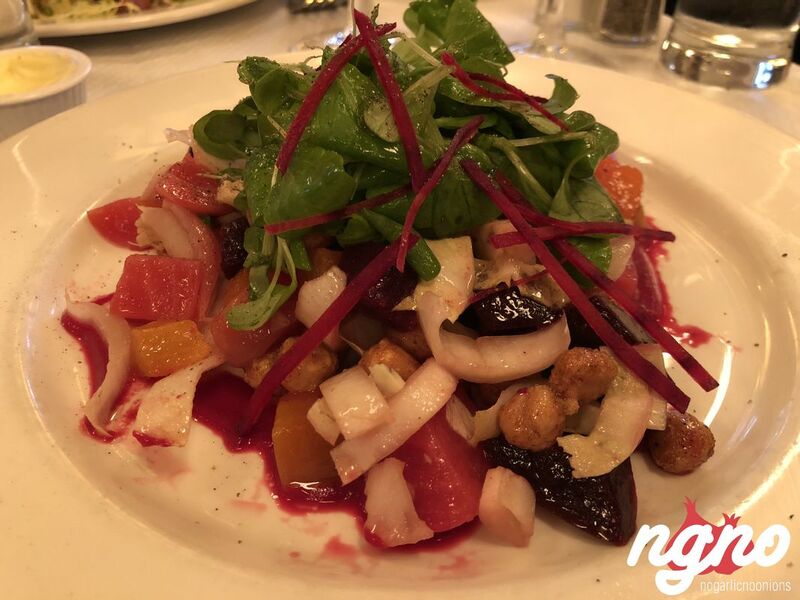 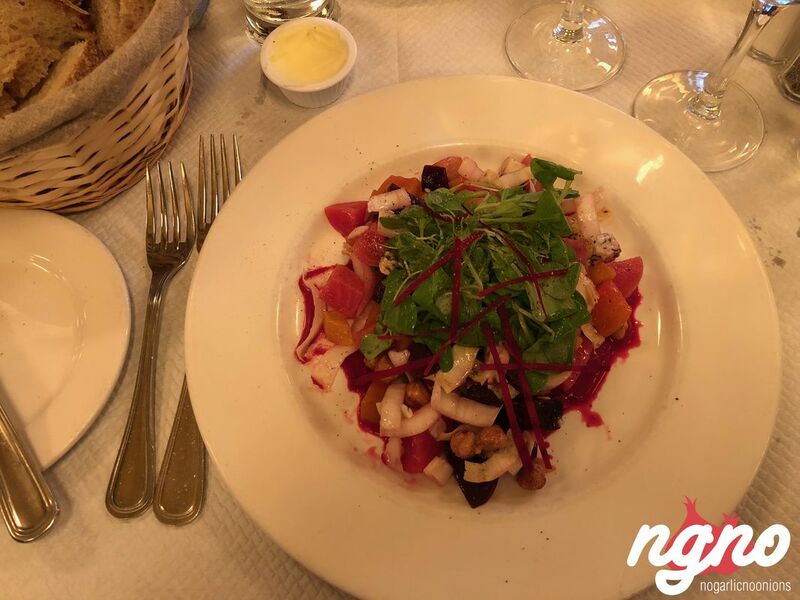 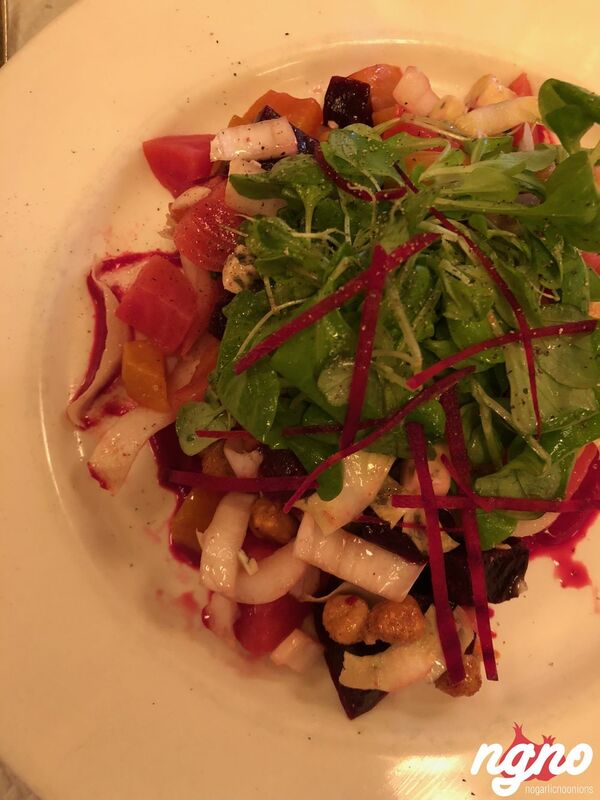 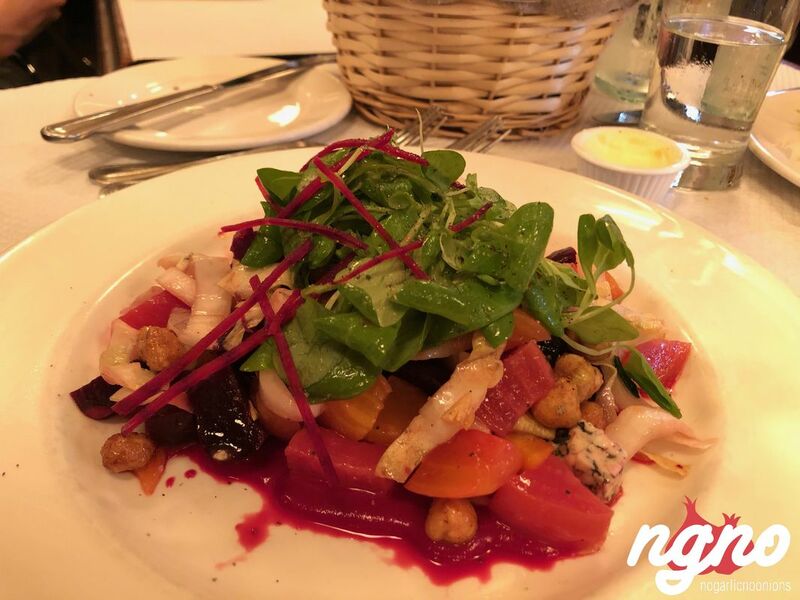 The beetroot salad is a recommendation: imagine sweet cubes of beetroot, crunchy chickpeas, endives, Rochefort cheese, mâche and fourme d’Ambert. 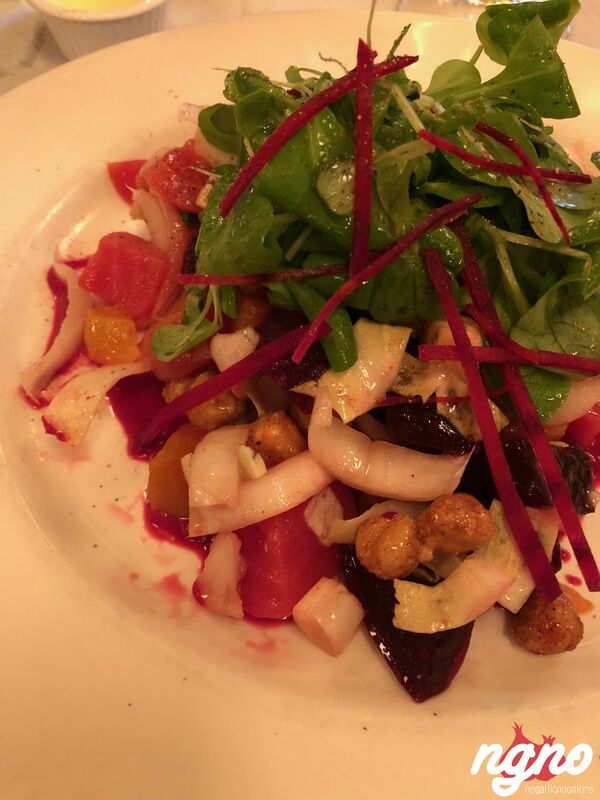 The salad is so yummy, I couldn’t but finish it completely. 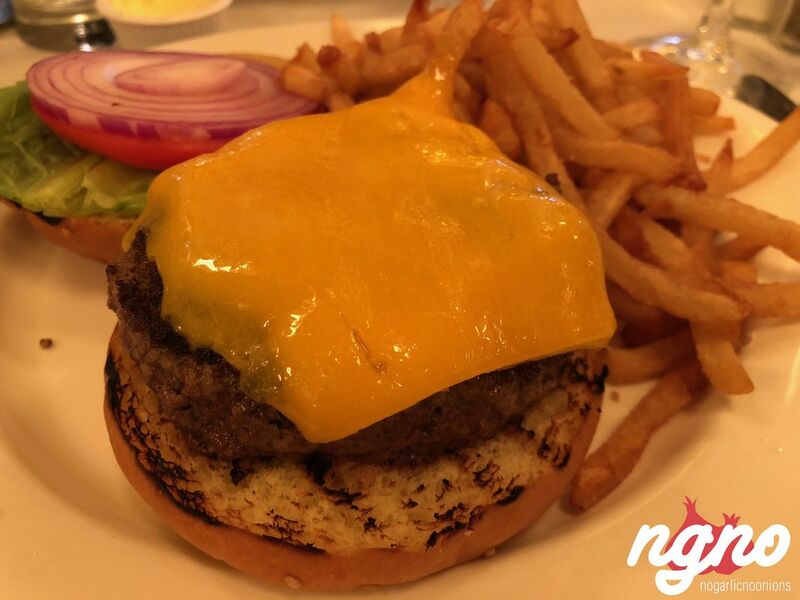 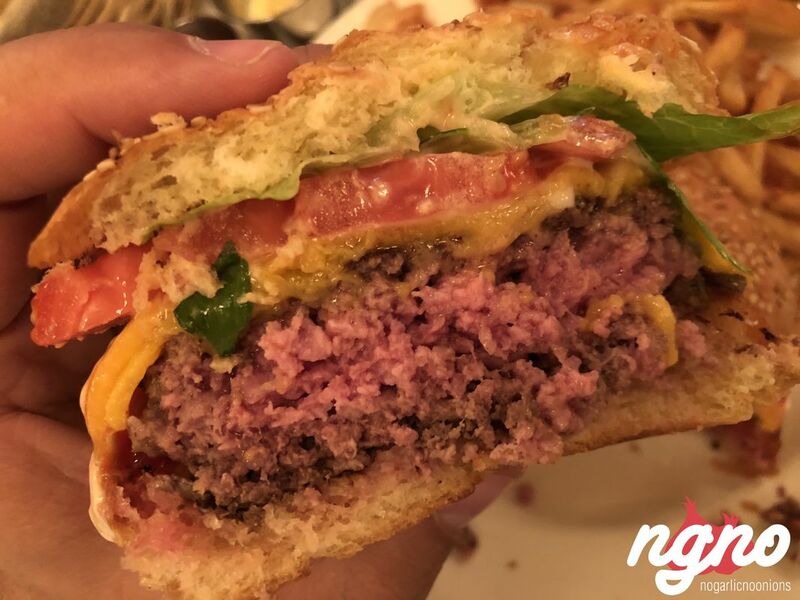 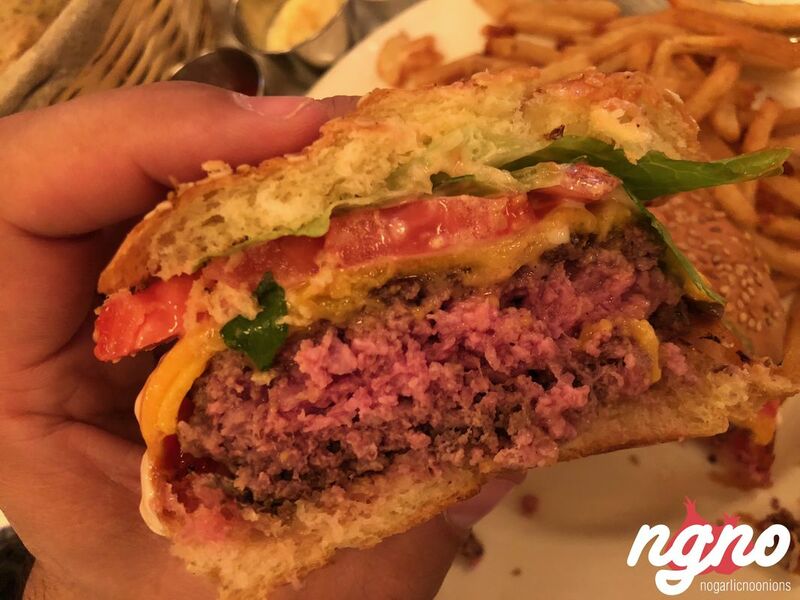 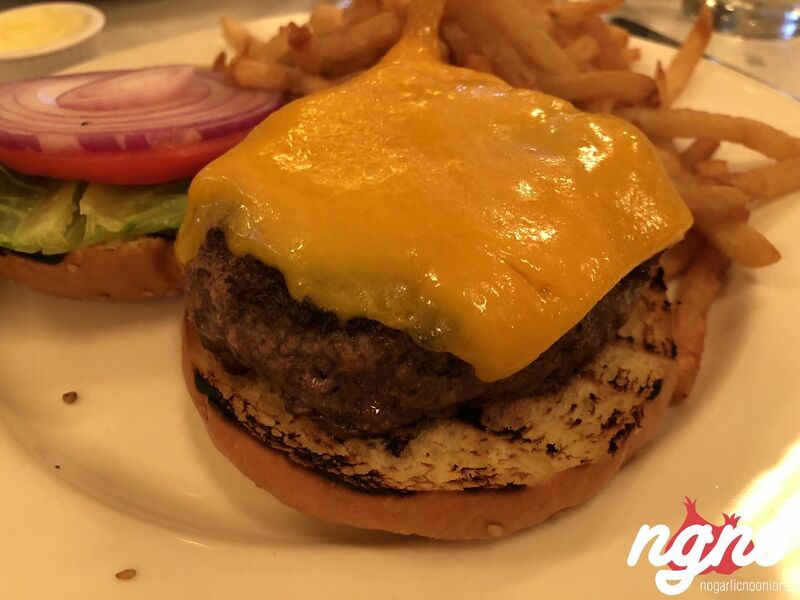 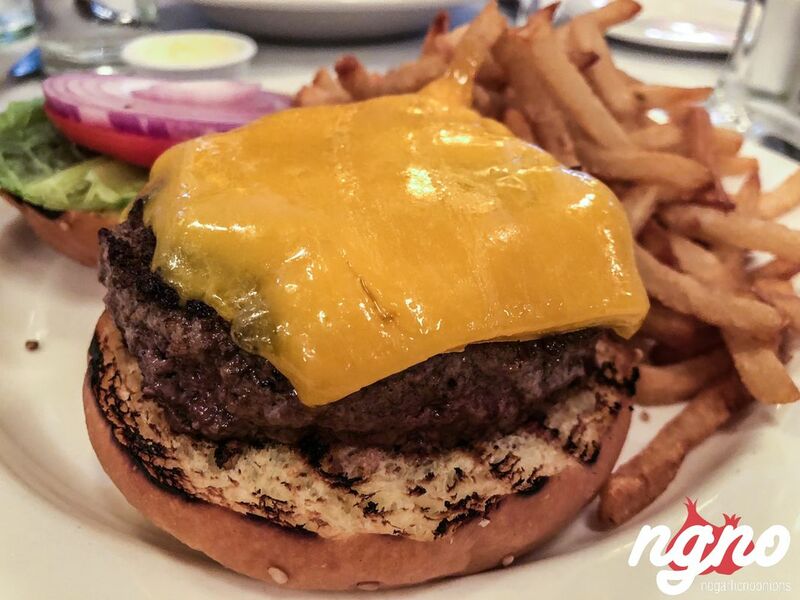 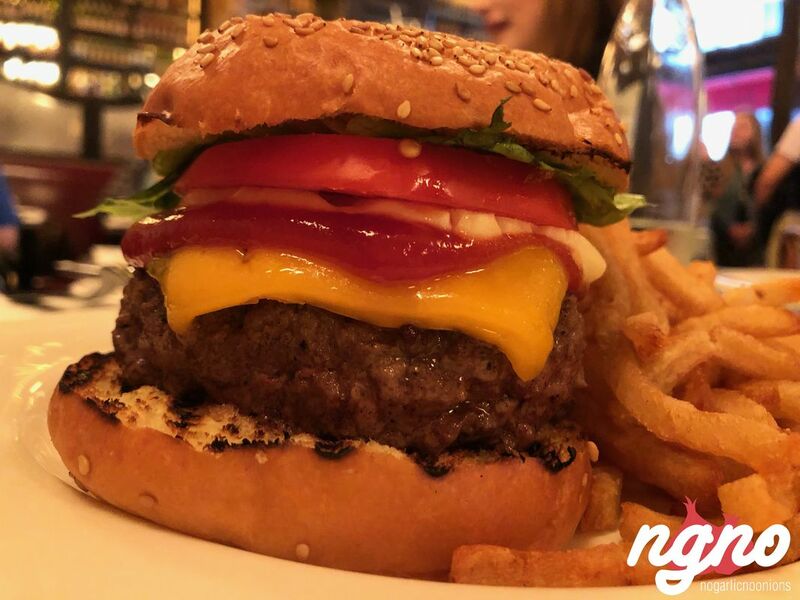 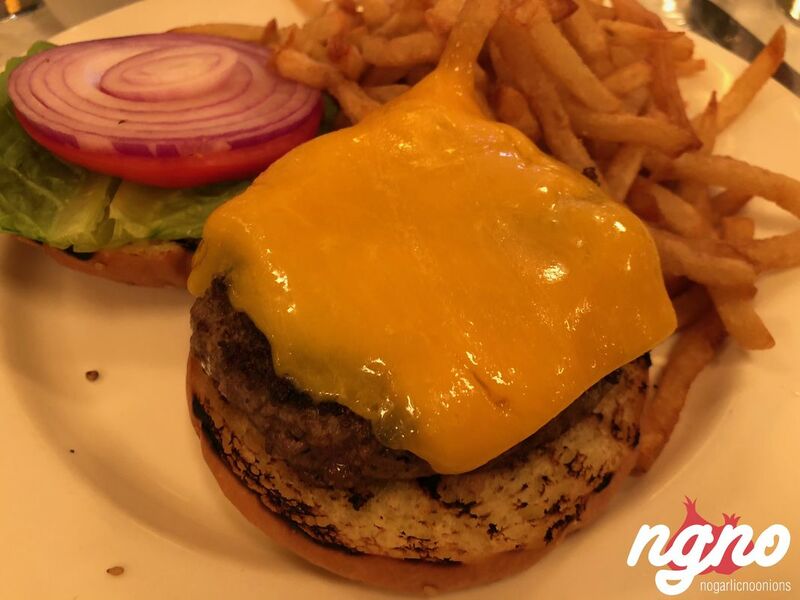 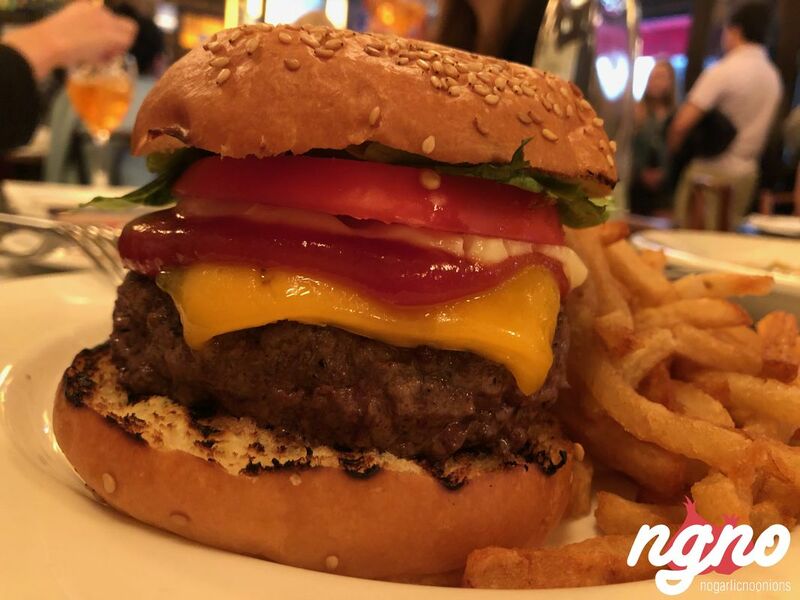 The most gourmet of burgers is fitted with a very thick juicy patty cooked rare, a slice of cheddar cheese, fresh crisp vegetables and a side of fries. Add ketchup, a spread of mayonnaise and enjoy the most gourmet of burgers New York has to offer. 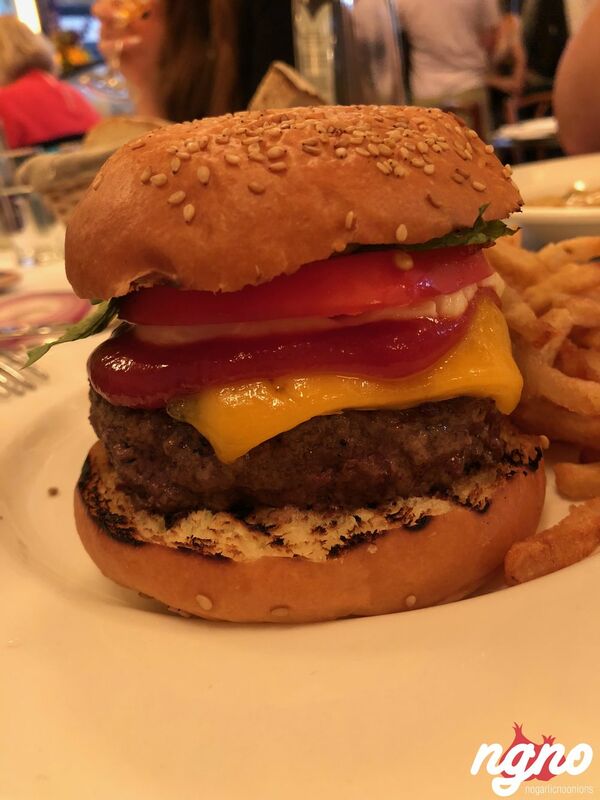 The patty is so thick and is so perfectly prepared that it leaves pleasant after-notes of pure beef in the mouth and the simplicity of this sandwich makes it perfect! 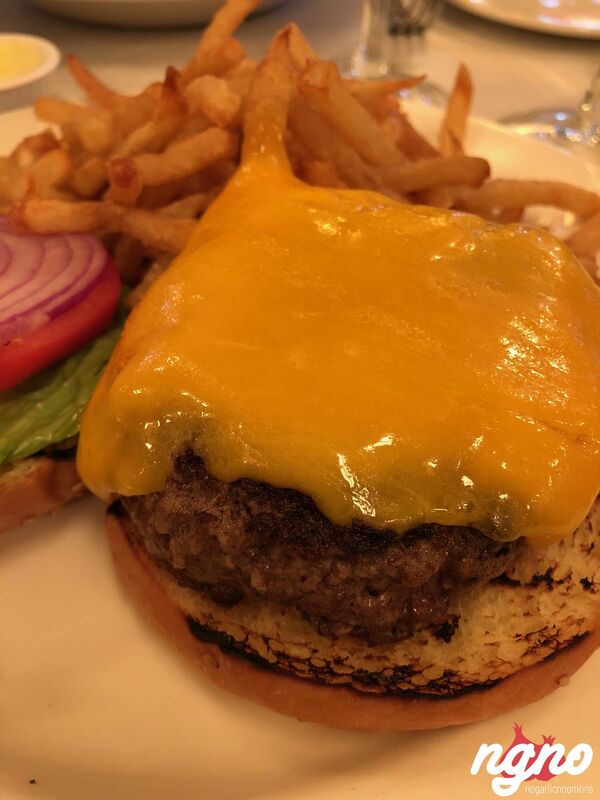 The fries are crunchy, thin and crispy. 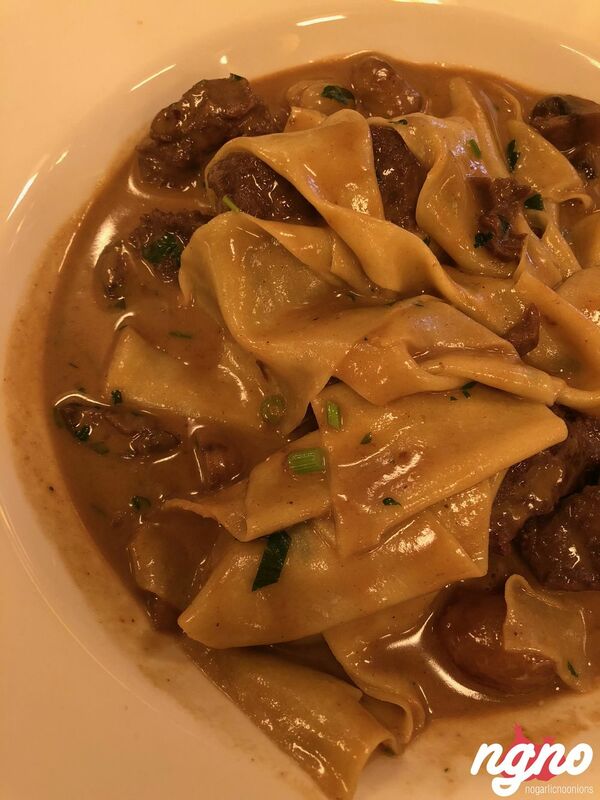 The boeuf stroganoff is one hell of a unique plate! 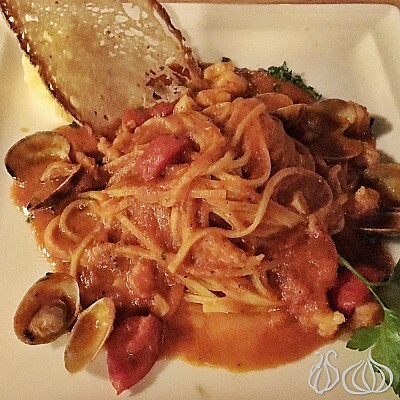 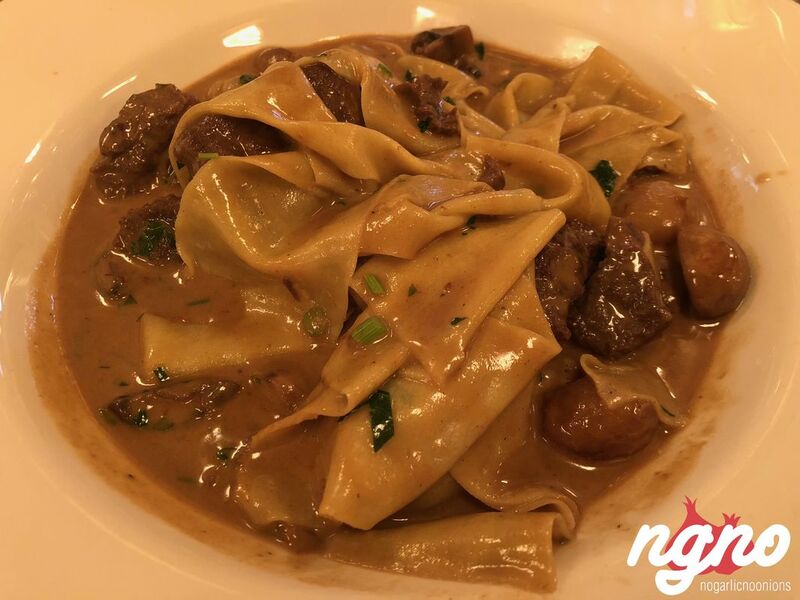 No rice but a blend of papardelle buttered pasta mixed in a creamy sauce with caramelized onions. 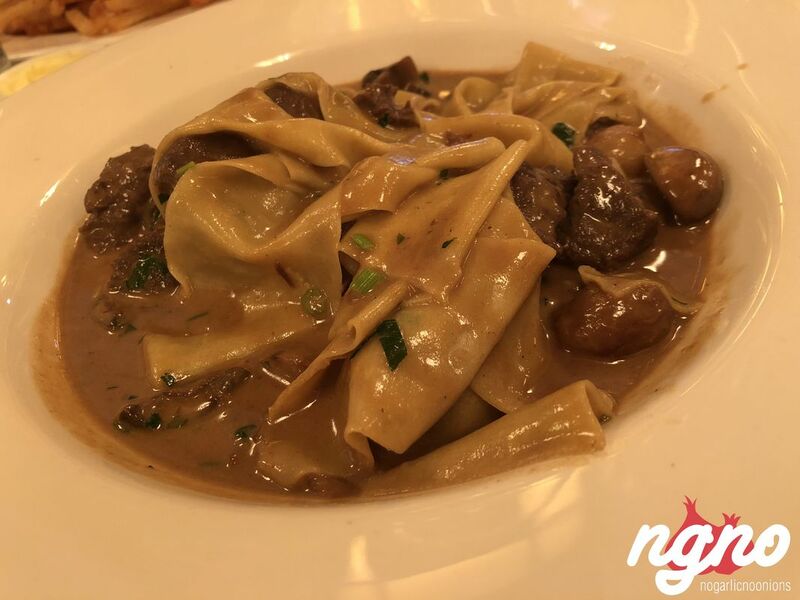 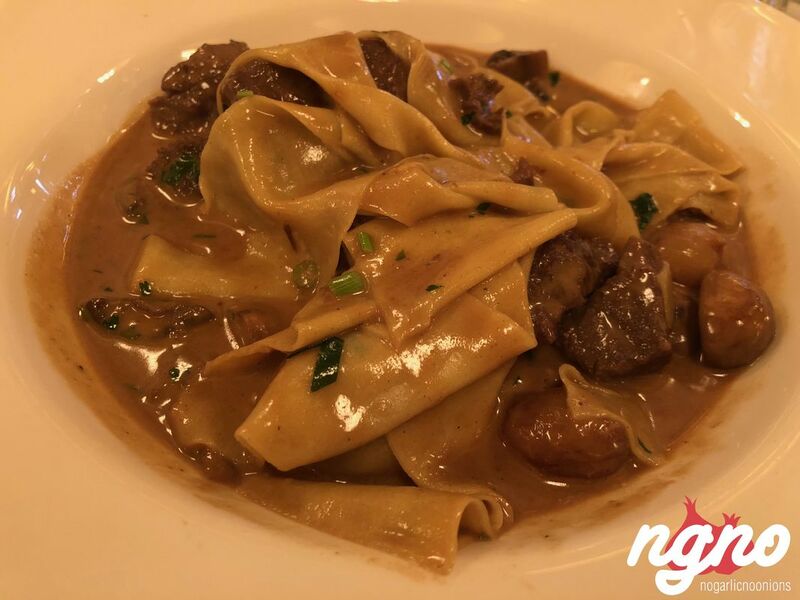 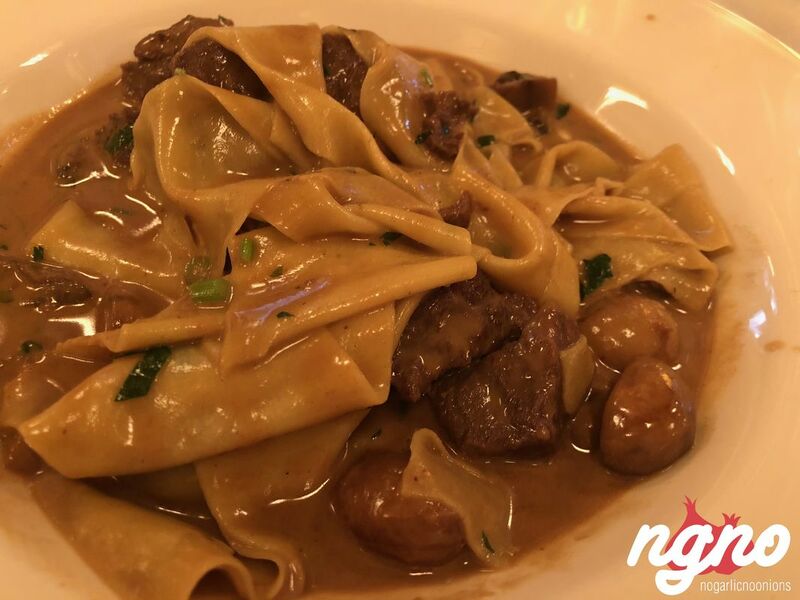 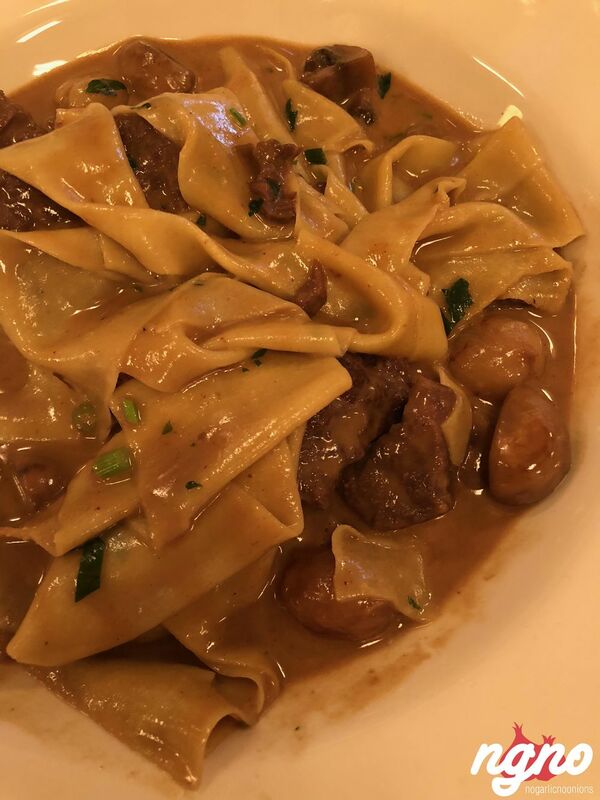 Sheets of pasta cooked aldente, chunks of longly marinated beef to fall off the fork and small-sized juicy mushrooms in a superb sauce signature of Balthazar. 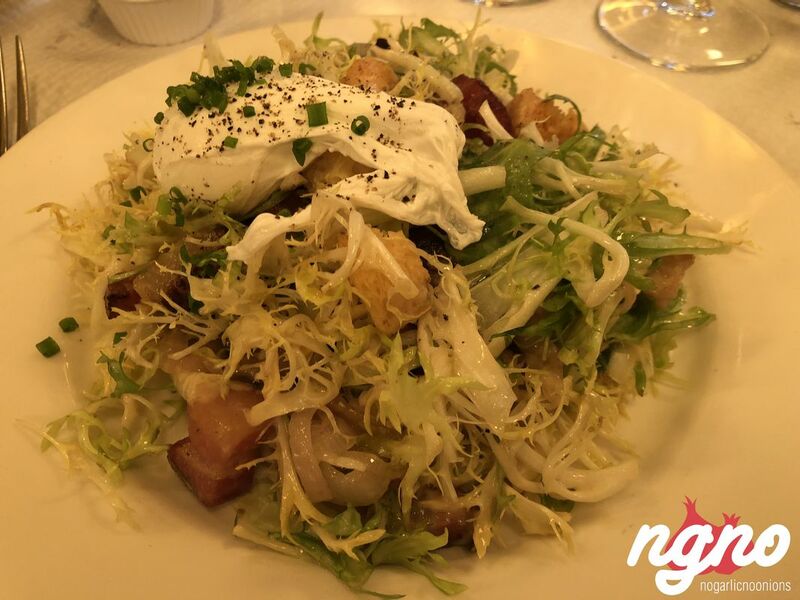 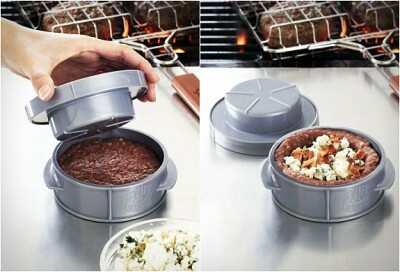 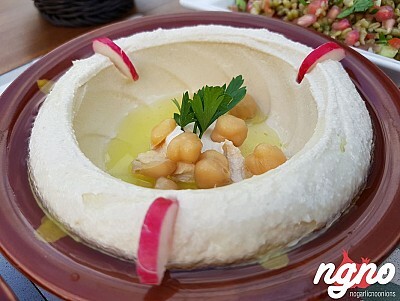 Exceptionally fantastic, this lunch will be remembered for long. 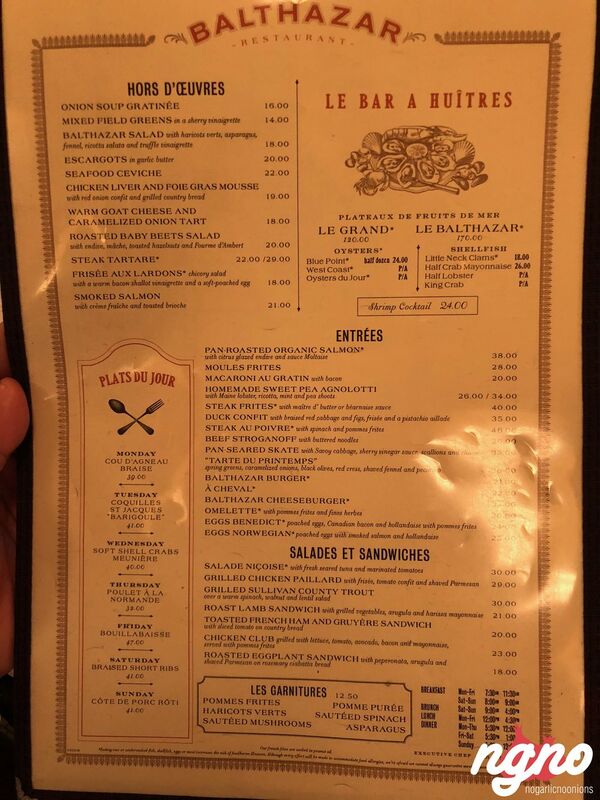 Food at Balthazar is out of this world.